Set the tone for summer by booking the spring of a lifetime. With 192 miles of gorgeous beaches, abundant wildlife and luxury resorts offering special spring packages, Riviera Nayarit couldn’t make it easier to ditch the pea coat for your favorite neon bathing suit. The Occidental Grand Nuevo Vallarta sits on a gorgeous stretch of golden beach primed for romantic sunsets. Following its US$14 million renovation, the all-inclusive resort offers deluxe room accommodations; all meals, snacks and beverages; non-motorized water sports, daily activities, nightly entertainment and much more. In addition to the all-inclusive amenities, up to two children eat, play and stay for free. They will enjoy the kid's section of the pool and the supervised Kids’ Club, which offers a variety of activities for the younger guests. Save up to 46 percent with rooms starting at US$80 per person, per night including hotel taxes and gratuities when you book your travel between May 1 and August 18. For more information, please call 1-800-858-2258 or visit their website at http://www.occidentalhotels.com/grand/NuevoVallarta.asp. This gorgeous and recently renovated all-inclusive resort is located beachfront in Nuevo Vallarta. Riu Palace Pacifico’s “Riviera Nayarit is Calling!” package includes a stay in a standard room along with the highly regarded All-Inclusive by RIUTM service which provides everything from dining and drinking to water sports and nightly entertainment. Rates for the “Riviera Nayarit is Calling!” package start from US$105 per person per night based on double occupancy with tax included when you book by April 30 for travel between April 1 and June 22. For more information, please call 1-888-RIU-4990 or visit their website at http://www.riu.com/en/Paises/mexico/vallarta-riviera-nayarit/hotel-riu-palace-pacifico/index.jsp. Located in historic San Blas, Hotel Garza Canela provides an intimate escape into another world. Family-owned and operated, this is the perfect place for eco-tourists and nature lovers alike. Get lost in the colors of the wildlife and prepare for more than a vacation because Hotel Garza Canela is a true Mexican experience. The hotel is also known for the superb cuisine at its El Delfin Restaurant. The “Spring Package” provides accommodations for US$80 per night based on double occupancy including taxes. Two children under 12 years old may share the room at no additional cost. Rates during Easter week are US$140 for two people, including taxes. Children under 12 years old are an additional US$20. Breakfast is included during Easter week. For more information, please call 1-800-713-2313 or visit their website at http://www.garzacanela.com/. The “Stay Longer, Third Night Free” package is available from April 6 through December 20. Rates begin at US$480 per night based on a double occupancy. Complimentary night must be used in conjunction with initial stay. 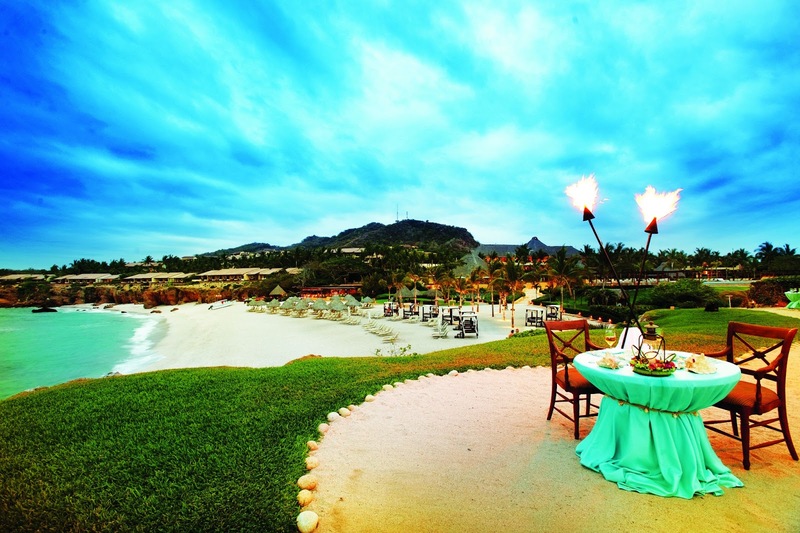 For more information, please call 1-866-280-9490 or visit their website at http://www.fourseasons.com/puntamita/. Book the “Sunsational Savings” package and receive the third night free! Also included in this package is daily full breakfast at Las Marietas or Sea Breeze restaurant, signature St. Regis Butler Service, complimentary 24-hour access to the exercise room, complimentary access to relaxation areas at Remède Spa and free use of the Children’s Club (ages 5-12). Rates for the “Sunsational Savings” package start at US$735 per night based on double occupancy in a Deluxe Garden View Room. Rates for the Deluxe Ocean View Room begin at US$885 per night based on a double occupancy. Offer is valid for travel through April 8th. For more information, please call 1-877-787-3447 or visit their website at http://www.starwoodhotels.com/stregis/property/overview/index.html?propertyID=1734&EM=VTY_SR_1734_PUNTAMITA_PROP_OVERVIEW. Marival Resort & Suites is a 5-star, all-inclusive beachfront property in Nuevo Vallarta. From a la carte to gourmet, buffet to brunch, it features all the things guests enjoy—with a finer touch. This spring take advantage of savings of up to 45 percent plus free upgrades to suites. Rates for this promotion start at US$96 per person per night when you book by April 30 for travel from May through September. For more information, please call 1-877-222-0302 or visit their website at http://www.marival.com/. Marival Residences & World Spa, the recipient of the 2012 Trip Advisor Traveler’s Choice Awards, is offering an irresistible spring promotion this year. Guests can enjoy 45 percent savings plus get the 5th night free in the luxury ocean view category. Additionally, up to two kids stay free in luxurious family two bedroom Residences. Rates for this promotion start at US$188 per person per night. For more information, please call 1-877-769-7376 or visit their website at http://www.marivalresidences.com/. Located on the beautiful beaches of Bahia de Banderas in the heart of Riviera Nayarit, Hard Rock Hotel Vallarta offers incredible views of the Pacific Coast, modern amenities and attentive service all infused with the spirit of rock 'n' roll. Book three nights or more and received up to US$1500 Resort Credit to be used towards room upgrades, tours, spa/beauty salon treatments, golf outings, the Colin Cowie Wedding Collection and more. Rates start at US$340 per room based on a double occupancy. Applicable Resort Credit depends on length of vacation and is applied per room/per stay to travel until December 23, 2013. For more information, please call 52-322-226-8470 or visit their website at http://www.hardrockhotels.com/vallarta.aspx.